It is important that all children have a vision screening by the age of 3 or earlier if any vision problem is suspected. Many of the eye problems affecting children are treatable, and early treatment can prevent life-long blindness. Below are several of the most common problems that effect children’s eyes. Strabismus refers to eyes that are misaligned and point in different directions. It may always be noticeable, or it may come and go. The eyes may cross in, drift outward, or one eye may be higher than the other. When the eyes are misaligned, two different pictures are sent to the brain. In a young child, the brain learns to ignore the image of the misaligned eye. This causes loss of depth perception and binocular vision, and often “lazy eye” (amblyopia) results. Adults with misaligned eyes usually have double vision. Strabismus also can run in families, and it is NOT outgrown. 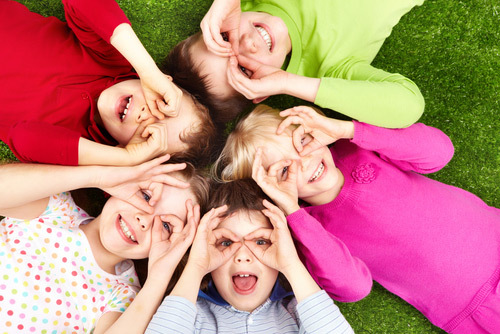 As a child gets older, the chance of developing normal sight and binocular vision decreases. Depending on the cause and type of eye misalignment, glasses, patching, eye drops, prisms and/or surgery may be recommended. Eye muscle surgery involves making a small incision in the thin tissue that covers the white of the eye, which allows the ophthalmologist to access the eye muscles. The tension of the eye muscles in one or both eyes is adjusted by repositioning the muscle on the eye. In about 25% of patients, the eyes are not adequately aligned after surgery, and a second surgery may be needed. Eye muscle surgery is an outpatient procedure, and recovery is generally quick. Lazy eye, or amblyopia, is poor vision in an eye that did not develop normal sight during early childhood because a blurry image was sent to the brain. It is preventable, but it can be corrected only if it is treated during childhood. If not treated early, amblyopia can lead to permanent vision loss in adulthood. Children with a family history of lazy eye should be checked early in life. The main causes of lazy eye are: strabismus (eye misalignment), unequal focus (need for glasses), or cloudiness in the normally clear eye tissues (such as cataract). To correct lazy eye, the child must be forced to use the poor-seeing eye. This is done with patching or drops in the good eye. A blocked tear duct in an infant can cause excessive tearing and mucus buildup on the eyelids and eye lashes. This occurs when a thin tissue in the nose does not open before birth, blocking the drainage of tears from the eyes into the back of the nose and throat. Many cases resolve within 6-12 months after birth. Blocked tear ducts can be treated with a brief outpatient surgical procedure in which a thin, blunt metal probe is passed through the tear drainage system to open the obstruction. Infants and children experience no pain after the procedure, but blood-tinged tears or nasal secretions are common. A drooping eyelid, or ptosis, in children may be present at birth, or it may develop during childhood. It can also become worse as the child grows. This needs to be closely monitored by an ophthalmologist to ensure that normal vision is developing in the eye with the droopy eyelid because it can cause a lazy eye. If the droopy eyelid is causing loss of vision, an outpatient surgical procedure can be performed to raise the eyelid height. Many children get one or more styes during childhood. This is a small, red area of swelling on the eyelid that may or may not be painful to the touch. Generally, home therapy is tried first. If it does not get better, a procedure can be performed to open up the stye so that it drains and resolves. A white pupil or difference between the pupils in the eyes needs to be evaluated as soon as possible. There are many causes for a white pupil. One of the more common causes is a cataract in children. A cataract in one eye can cause a severe lazy eye and blindness if it is not treated properly. 1. Am I too old to have surgery for my misaligned eyes? No! Eye muscle surgery to straighten the eyes can be performed at any age. Many adults with misaligned eyes have been told that “nothing can be done” or that the procedure in adults is “purely cosmetic.” This is incorrect. It has been shown that strabismus surgery in adults has many indications: elimination of double vision, improvement of 3D vision, expansion of visual field, elimination of abnormal head posture, and improvement of psychosocial function and vocational status. Call us today to schedule your evaluation. 2. Will my child outgrow his/her eye misalignment? No, a child does not outgrow this condition. The earlier that it is detected and treated, the better chance for development of normal vision into adulthood. 3. I think my child’s eyes are crossed or drifting, but I am not sure/I do not see it all of the time. Should he/she be checked? Yes! Sometimes it is difficult to tell if the eyes are truly deviating, so it is important to have a full evaluation by a pediatric ophthalmologist. 4. Will my child’s eyes be dilated at our first appointment, and how long will the dilation last? Yes, dilation of the eyes is a part of the complete eye examination in children. The pupils will remain large for several hours after the exam, and sometimes until the next day. The American Association for Pediatric Ophthalmology and Strabismus website is a great resource for more detail on these and other conditions diagnosed and treated by pediatric ophthalmologists.